Giant Isopods are found in abundance in the deep waters of the Atlantic, Pacific and Indian Oceans. Giant Isopods belong to the Clade Euarthropoda, class Malacostraca, and order Isopoda. There are twenty species of giant isopods including Bathynomus affinis, Bathynomus giganteus, Bathynomus brucei, Bathynomus bruscai, and Bathynomus crosnieri among others. The species Bathynomus giganteus is arguably the largest isopod globally. These isopods are close relatives of shrimps and crabs. In 1879, French zoologist, Alphonse Milne-Edwards became the first man to clearly define the genus of giant isopods from samples he and his colleague collected from the Gulf of Mexico. 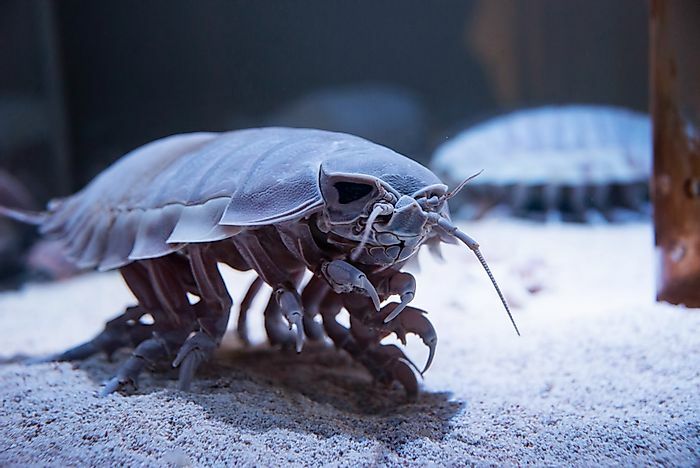 Giant isopods are a good example of abyssal gigantism (deep-sea-gigantism), where animals that dwell in the deep sea are larger than their relatives that live in shallow waters. These species are in two groups, giants and super giants. Giants have adults measuring between 3.1 and 5.9 inches long whereas super giant adults are between 6.7 and 19.7 inches long. The maximum lengths and weights for a supergiant are thirty inches and 3.7 lb respectively. The shapes of these species resemble that of their terrestrial relatives, the woodlouse. The axis joining their ventral and dorsal sides are compressed and a rigid exoskeleton with overlapping segments protect their bodies. Giant isopods can also curl up into a ball-like shape leaving the tough shell exposed for protection. Bathynomus have large compound eyes spaced far apart on the head and they also have approximately 4,000 ommatidia units. These species have two pairs of antennae on the head, seven pairs of thoracic legs, and five segments of the abdomen. The first two pairs of legs are for holding and carrying food to the jaws, and the other pairs are for swimming. In color, isopods can be pale lilac or pink. Giant isopods are gentle feeders. Researchers also believe that giant isopods live in a constant state of semi-hibernation, probably because they take time between meals due to the low supply of food in their habitat. In addition to the compound eyes, giant isopods also use other senses in the antennae to communicate and move. Giant isopods live between 550 feet and 7020 feet deep, however, there is a probability that some live deeper in colder waters. Most isopods prefer clay or mud where they also find shelter and hide from predators. These sea species mostly live in the Pacific Ocean, off the coast of Japan and also in the South China Sea. Some also live in the Gulf of Mexico, the Caribbean, and the West Atlantic Ocean between Brazil and Georgia. Initially believed to be scavengers, recent evidence suggests that they also eat animals like sponges. In addition, they can stay for long without eating, months or even up to four years but when they are hungry, they do eat a lot at one time. They also eat crab, shrimp, fish, and whale carcasses. Some specimen retrieved from the Gulf of Mexico discovered plastic in the stomach contents although it is not clear whether or not they feed on plastic. Most species reproduce during the spring and winter months, perhaps because of the inadequate food during summer. Males have two specialized organs; white appendages on the top that carry sperm and appendices at the bottom which transfer sperm to the female. The male injects sperms anywhere on the softer female after she molts. Females of reproductive age have a brood pouch (marsupium) that holds twenty to thirty eggs when sexually active and it is where the young ones hatch and come out as miniatures called mancae. The eggs usually have a diameter of 0.51 inches. Females do not eat during the brooding period and have limited activity to conserve energy.